When Olly Moss teased on his Twitter account last Monday that he had a huge drop coming later in the week he wasn’t messing around! Yesterday, Olly announced he’d collaborated with Pottermore to release a series of officially licensed Harry Potter prints based on the iconic series of fantasy novels. Originally commissioned as covers exclusive to the German Harry Potter audio books, these beautiful images designed in Olly’s signature style can now be purchased as 16”x24” hand numbered giclee art prints. 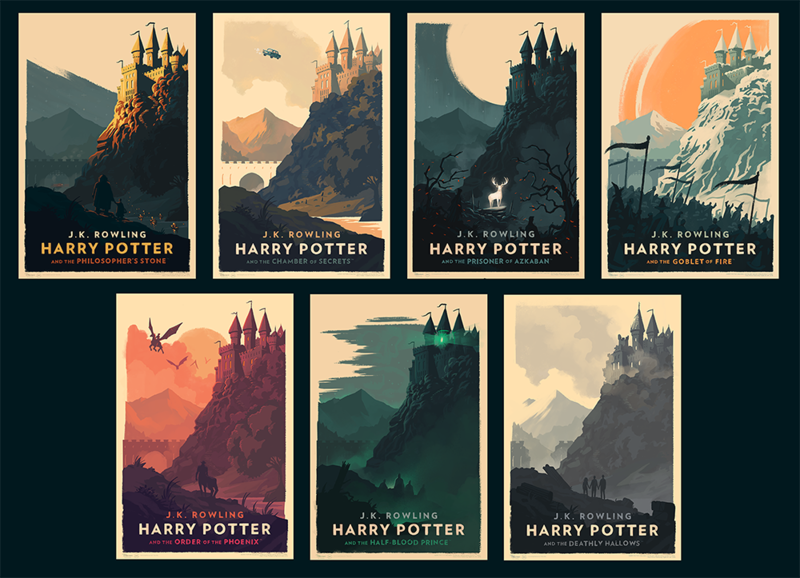 Olly has released a different print for each book in the beloved Harry Potter series – that’s seven prints in all! What’s awesome about this new HP series is that it is a time edition, meaning any orders placed between now and 3pm BST on Monday, October 25th, at Olly Moss’ online store will be guaranteed a print. Each novel’s print size will then be based on the orders placed. Each Harry Potter print will retail for $50, or you can purchase a complete set of 7 prints for $275. And any orders including 4 or more prints will be shipped flat! How can you pass up on opportunity to add seven Olly Moss prints to your collection!?! Olly hasn’t been doing many prints over the past few years and this set is stunning to say the least!